An anti-immigration talk planned by a student group from Wilfrid Laurier University that was to take place on the University of Waterloo's campus has been cancelled due to skyrocketing security costs, one organizer says. An anti-immigration talk that was scheduled for Monday at the University of Waterloo campus has been cancelled because of high security costs, one of the organizers says. Wilfrid Laurier University student Lindsay Shepherd — who made headlines last fall after she was sanctioned by a professor for showing a video featuring controversial University of Toronto professor Jordan Peterson in a class she was leading — said UW upped its initial price tag for the event from $1,600 to $28,500. UW confirmed the cost for event security would be $28,500. 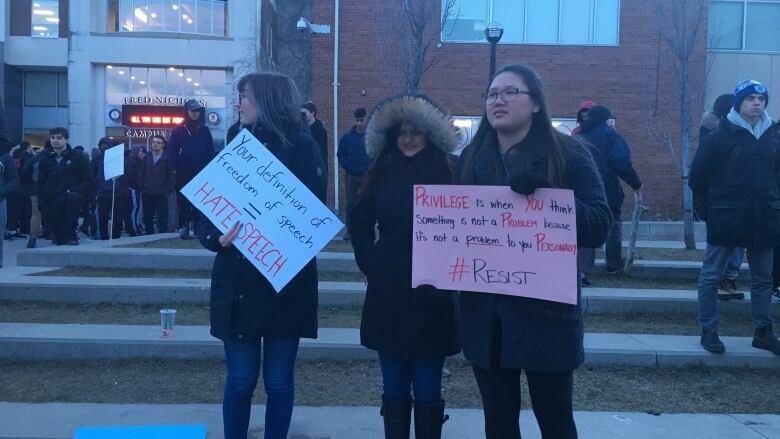 The event, planned by the Laurier Society for Open Inquiry, was to have former Rebel Media reporter Faith Goldy and University of New Brunswick professor Ricardo Duchesne talk about their views. Both have expressed anti-immigration sentiments in the past. It would have been a return to the area for Goldy, who was scheduled to speak at Laurier in March but didn't get a chance because a fire alarm was pulled just before her talk. Shepherd had tweeted Laurier "refused to accommodate our event." Laurier officials said there wasn't enough time to plan the event properly. "Well, University of Waterloo didn't seem to have a problem working with us and getting this event together in under a week, figuring out security arrangements and everything," Shepherd said on Twitter. Then on Wednesday, she said the price went from $1,600 for security to $15,000 "as many groups have communicated their intent to protest, and there is a high risk of danger. We don't have the money, so cancellation is likely." Later Wednesday, she said the cost had ballooned to $28,500 and the event was cancelled. "There is no way we can pay that," she said. UW president Feridun Hamdullahpur said in a statement the university "cannot shy away" from opposing views, but the university was just a venue for the talk and did not support the views of the speakers.